One of cinema’s greatest gifts is the ability to whisk its audience away to somewhere new. It can open our eyes to new and exotic lands, force us to look at familiar locations from a fresh perspective, or transport us through outer space to galaxies far, far, away. At the very least, a film’s location should help set the scene, give its audience an idea of what to expect. But there are few things more satisfying than when location is used as more than a pretty setting; becoming a living, breathing ecosystem that provides insights into characters, or that is intrinsically linked with plot. Samuel Maoz knew this when making Lebanon, a claustrophobic war film set almost entirely inside a tank. Alfred Hitchcock understood this too, when he constructed his busy apartment courtyard in Greenwich Village for Rear Window. In Play Time, Jacques Tati built a futuristic city for Monsieur Hulot to bumble through, both for the delight of his audience, and to shine a light on the absurdity of modern technology. These directors captured the importance of the micro and macro uses of space to tell their story in masterful ways. Akira Kurosawa perhaps offers the most in-depth, and ultimately satisfying use of location in his cat-and-mouse kidnap drama High and Low. He manages to create nail-biting drama within the four walls of a wealthy shoe magnate’s hilltop mansion, before unleashing it onto the winding, suffocating streets of Yokohama below. Based on Ed McBain’s 1959 novel King’s Ransom, Toshiro Mifune’s Gondo finds himself in a moral quandary when his driver’s son is kidnapped. It is a case of mistaken identity, the assailant thought he was snatching Gondo’s child, but regardless of the victim’s identity, the wealthy shoemaker is expected to foot the bill. It is a film that poses deep ethical questions about the burden of responsibility, and showcases powerful, nuanced performances from the entire cast. But what separates High and Low from other police procedurals and insightful character studies, is the manner in which Kurosawa brings the world these characters inhabit to life. It starts with the city, Yokohama in the early 1960s. A city that was devastated by an earthquake in 1923 and rebuilt by a resourceful, unshakable population; only to be decimated again during the Second World War. It did not bounce back quite so quickly on that occasion, but is once again on the rise. This is the city presented to us in the opening minutes of High and Low. Kurosawa shows us extreme wide shots of Yokohama to give us a clear idea of its scope. The film’s opening shot depicts a busy cityscape, with parks and apartments in the foreground, highways and trains dominating the middle of the frame, and in the background, the city’s busy port. The next two minutes contain similar shots: industrial landscapes filled with towers, cranes, and billowing columns of smoke. This smoke engulfs the city as these shots progress, alluding to a city being swallowed up by progress. Through these opening shots, Kurosawa depicts the scale of the city, and in doing so, appropriately captures the size of the task facing the police to track down the kidnapper. It is a particularly intricate haystack to attempt to find a needle in. This collection of establishing shots is brought to a conclusion with one final look at the city, this time behind the windows of Gondo’s luxurious, hilltop mansion. It is a fitting place to end the tour, as the viewer will not leave his home for the next 50 minutes. Stylistically there is nothing extravagant about his home, Gondo adopts a minimalist approach to decorating, which compliments his humble roots and no-nonsense approach to business. Far more important than the abode’s decor is the function it plays throughout the entire film, and especially in this opening act. The residence is used for business meetings, a playground for the children (doubling as the Wild West in their imaginations), a crime scene, a makeshift police headquarters, and, in the briefest of moments, a family home for the Gondo’s. While Kurosawa is getting creative with the uses of his space, there is also a sense that he is fighting his instincts as a filmmaker, as the first hour of the film sees a drastic break from his traditional approaches. His trademark large crowds, busy sets, and intrusive natural elements, instantly recognizable traits of the master filmmaker, are all kept to a minimum during the tense opening hour, the Gondo house almost acting as a barrier to the outside world. Groups do congregate in the large living room, but thanks to the open space and high ceilings, it never feels cluttered. In brief instances we do hear the howling wind, but it is just as quickly shut out by the sliding doors which overlook the city. For much of the first hour, we as an audience are locked in the Gondo residence but we are not alone, as the home takes on the function of a prison for many of the characters. Gondo, so proud and sure of himself in his opening exchanges with his business rivals, finds himself completely at the mercy of the kidnapper, who it is established has a vantage point that allows him to see clearly into the living room. No longer the master of his own house, afraid to venture too far away from the telephone lest he miss the kidnapper’s demands, even an attempt at some tranquility in his shower becomes a race against time to answer a phone call. He is not the only one trapped in these early scenes. His cold and calculating assistant Kawanishi (Tatsuya Mihashi) remains by his side for much of the ordeal. Repeatedly he attempts to leave, on an errand to close an important business deal for his employer, but time and time again he is called backed, at the request of others or through circumstance. Chief Detective Tokura (Tatsuya Nakadai) and his team are similarly restricted during their time in the house. Police involvement was strictly forbidden by the kidnapper in his initial demands, resulting in them hiding round corners and crawling on the floor to avoid detection. The rules of the normal world do not apply in the house on the hill; the usually strong and imposing Gondo is reduced to a broken man, cowering behind his curtains, and law enforcement must hide themselves away from the criminal. It is a restricting setting for the characters, but thanks to Kurosawa’s masterful direction, that is never the case for the audience. So at home with his ambitious, elaborate outdoor settings, or filming charging armies in the pouring rain, it almost feels like he’s challenging himself with this stripped back, minimalist setting. Of course, the unfolding tale of abduction and extortion goes a long way to captivate, but the director’s approach to shooting also deserves its share of the credit. He takes advantage of the setting to fully explore the house with his camera, capturing the main living room from multiple angles and perspectives, and makes best use of the large rooms, planting characters in the fore, middle and backgrounds of shots, to add depth. The adoption of long shots also plays an important factor in capturing the space. The camera lingers on the action as it unfolds, slowly following characters as they move around the living room. It is an unblinking eye, giving the viewer the impression that he or she is a guest in the house. It also makes everything feel more immediate, offering little break in the tension, and creating the notion that every second counts. The scenes within the Gondo house are brought to an abrupt end with a frantic, six minute sequence on a crowded bullet train, in which our protagonist pays the ransom by throwing bags of Yen out of a bathroom window. The train scenes are at complete odds with what has come before them, bearing far more of Kurosawa’s visual hallmarks. Here the frames are packed from front to back with commuters, with ever-changing scenery whizzing past the window. It is a rousing conclusion to the methodical, thoughtful chapters that have come before, and marks a change in the rules going forward. Now the work begins for Detective Tokura and his team. Now they can explore the city, in search of Tsutomu Yamazaki’s meticulous kidnapper, Takeuchi. Shortly after the kidnapped child is recovered, we find ourselves in the smoky police headquarters with the hordes of men Tokura has at his disposal for the investigation. The room itself has only one discernible feature, the massive wall map of Yokohama, which is fitting, as the information provided in this room is our window to the rest of the city. What follows is a 13-minute breakdown of all the different facets of the case down to every minute detail, examining the locations of the potential phone booths the ransom calls were made from, all the way down to the ether that was used to subdue the child. It is a fascinating blow-by-blow account of the excruciating level of detail law enforcement agencies must go through when attempting to break a case, but it also manages to give us a snapshot of the city they are exploring in painstaking detail. While these reports are being given, Kurosawa skillfully weaves in images of the police at the locations in question. These are quick edits. Initially, we don’t stay in any location for more than a minute at a time, but it lays the groundwork for what becomes some of the most impressive feats of worldbuilding in cinema. These locations are not just for the purpose of providing the audience with perspective on the city. Every clue followed up, every location visit, no matter how minor, provides a pivotal piece of information in the investigation. The kidnapped child draws a picture of what he saw when he was held captive. It is a crude version of Mount Fuji and the seaside, which suggests a coastal hideout. The detectives then use the position of the sun in the drawing, along with specific sounds of a train, heard on a recording of the ransom call and corroborated by a trainyard expert, to narrow down the particular area along the coast that the train in question runs on, which then leads them to the hideout of Takeuchi’s accomplices. It is one example of many within the film of how everything is planned out to precise perfection, how each part of the city represents an essential piece of the puzzle, which will eventually bring the kidnapper to justice. Of course, Kurosawa did not build the city from his own imagination, but what he does deserve credit for is utilizing the diversity of the city to his full advantage. The police reports show us the polluted canal front, Yokohama’s commercial and industrial districts, the city’s major transportation systems in the form of the turnpikes and the trains, and the scenic coastal areas. The locations depicted are in stark contrast to the comfort and wealth presented in Gondo’s secluded mansion. 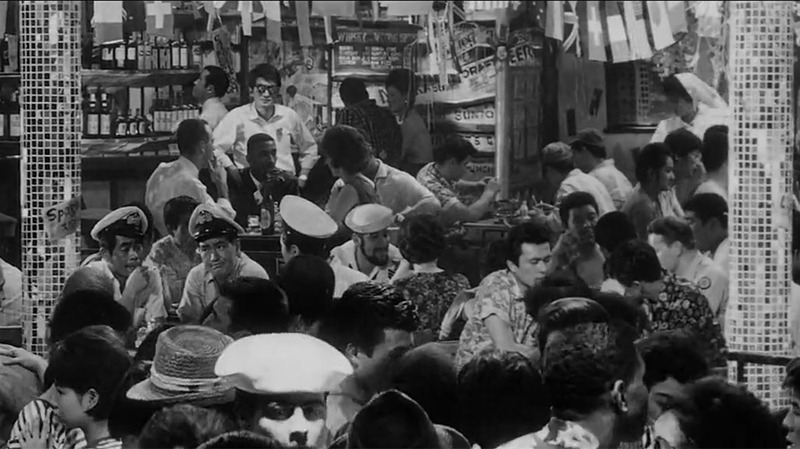 Kurosawa’s Yokohama is one that is overcrowded, with a population that has to toil and scratch for the little they do have. In this short sequence, the disparity between the protagonist and his hometown is uncomfortably evident. This is none more prevalent in the one city location that escapes the attention of the vigilant investigators, the home of Takeuchi. The kidnapper leads us there himself, shortly after the ransom is handed over. In our first proper tour through the streets of the city, we start seeing things from his perspective. As we follow him through a narrow labyrinth of lanes and side streets, we see barred windows, roaming packs of dogs and gangs of kids, we see laundry hanging from second floor windows. The contrast in locations is striking. We see the cramped, cluttered squalor of Takeuchi’s apartment, as far removed from the mansion house as possible, reinforced by Kurosawa’s decision to shoot the kidnapper in close-up. It is a claustrophobic approach, like the walls are closing in. Along with the relentless heat, it is of little wonder he is driven to such drastic actions. Then we get the final nail in the coffin, a view from his window, through the trash-filled, tin roofs which make up Takeuchi’s skyline, we have a clear, unrelenting view of Gondo’s hilltop palace. It’s safe to say that this is the taunting image that drove him to his crimes. These contrasting views of the city offer a symbolism very much in keeping with the film’s original Japanese title; Heaven and Hell. If this idea is introduced during the police report sequence, it is fully realized during the film’s climax, in which Tokura and an army of undercover officers discreetly tale Takeuchi through Yokohama’s more sinister areas. The sequence begins in familiar territory, we start with a wide shot of Takeuchi at the waterfront, taking in what will be his last look at freedom. He then ventures to the commercial district, a lively collection of storefronts, crowds, slow-moving traffic and blaring music. From these established city landmarks we are then taken somewhere new, to a crowded dance club. By far the busiest setting in the film, the screen is bursting with revellers. Kurosawa makes the club intentionally difficult to comprehend. The club features multiple mirrors, hanging décor that obscures clear vision, and multiple levels separated by invisible steps, truly an intoxicating and disorienting venue for onscreen characters and viewers alike. It is a nightmare scenario for the pursuing officers, for even the camera struggles to keep track of Takeuchi, as he weaves his way onto the dance floor, to complete a sly handoff with his drug dealer. Here he is using the venue as a weapon, to avoid detection from potential prying eyes. His next stop takes him to Dope Alley, a notorious portion of the city populated by drug addled zombies who populate the rundown streets. It is here that we feel we have truly descended into hell, with enveloping shadows that call to mind the most nihilistic film noir features of the 1930s and 40s. It’s another setting that suits his fiendish purposes, as he searches for a strung out drug addict to test his recently purchased poison on. It is a savage landscape where life is disposable, and the law of man is ineffectual, as witnessed when a hoard of addicts bar entry to the pursuing police officers. It is a fitting conclusion to this tale; with this final descent, we have truly seen how both sides live. Takeuchi is arrested shortly after departing Dope Alley. Ironically he is finally apprehended at the picturesque safe house of his two, now dead, accomplices. This quiet house, with its picket fence and picturesque views of the ocean offers one final contradiction, and one final glimpse for Takeuchi of the life he will never know. There is so much to admire in High and Low. Mifune shows his trademark rage, bubbling just under the surface, with lesser seen vulnerability. The attention to detail in the officer’s investigation makes it one of the most comprehensive and ultimately satisfying police procedures committed to film. But it is the use of location that makes the film stand out. It is a lesson in restraint and at the same time, an unapologetic urban epic. Kurosawa makes every home feel lived in, leaves no stone uncovered and makes you believe that every inch of the city is vital and teeming with life. Location in High and Low is no mere window dressing; it is motivation for dastardly crimes; it is collateral for small fortunes; it is obstructions, and clues, and evidence that will lead to justice; and it is metaphor for all the good and bad that lurks in society. It is proof, if it were needed, that Kurosawa was not just a master filmmaker, but a master architect. Geoffrey O’Brien’s essay on High and Low. The Criterion Collection. Accessed on March 8, 2018. 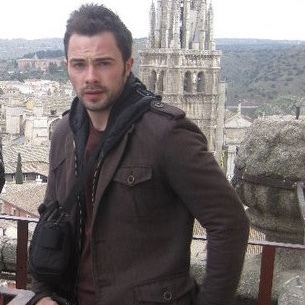 Michael is Scottish freelance film journalist, currently based in the United States. You can find more of his writing at The High Hat Film Review. He is also the host of The High Hat Film Podcast and a radio presenter, hosting shows about film, soundtracks, and composers. Follow him on Twitter @clancyhighhat. 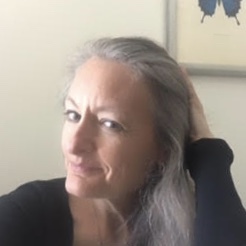 Carolyn A. Schroeder is an attorney, artist, photographer, writer, traveler, explorer and student of life. Originally from the Chicago area where she practiced law for 25 years, Carolyn now calls Hilton Head Island home, where she has enmeshed herself in the creative arts full-time. Carolyn received her B.F.A. from the School of the Art Institute of Chicago; and her J.D. from Northern Illinois University. She shares her experiments with art on Instagram.